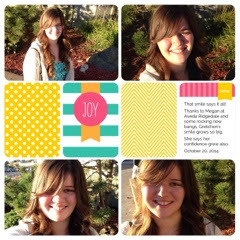 I just downloaded the #projectlifeapp in my iPhone (5). It works beautifully. And it coordinates with my #plxsu Project Life by Stampiin' Up! Items. I still love, and swear by My Digital Studio for my scrapbooking needs. It's some of those every day moments that don't get scrapped that I will use the Project Life app. While I am waiting for my son or daughter to get out of school or those other, I've got five minutes free what can I do, moments, this is how I will fill the time. You can choose what size you want to print to later - 12x12 or 8x8. You can share directly to Facebook or Instagram. Yup. Whether you are a social media buff or printed pages scrapbookers they have you covered. Of course there are add on "paper packs" and layouts. But the basics are pretty darn good. Good enough for my purposes. Hey if you do decide to try it, post in comments or email me you creation and I will post it here.